Refer to the following sample Desktop Support Technicians job interview questions and answers for getting ready for your upcoming interview. The customer service industry is one of the fastest growing industries today. The article provides tips and advice for customer-service job candidates. The article also provides typical customer-service job interview questions and answers. This article provides tips for a typical interview of customer service representative personnel with questions and suggested answers. In the call center industry, one of the most challenging issues is handling different customers - irate customer, offensive customer and defensive customers. Therefore, the cal center job interviews focus on your experience/skill facing a given situation - what does one usually do if ABC..? This article provides call center job interview questions, answers and interview tips. 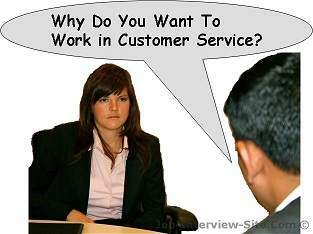 Why Do You Want To Work in Customer Service? The interview question ‘why would you like to work in customer service’ is among many other motivation interview questions asked in job interview. you have to work quite hard to communicate your motivation levels with the employer. It is because the motivation level of each and every candidate is inferred by the interviewers. This article provides interview questions for technical support positions; it also provides tips on answering these questions. The general responsibility of the help desk personnel is to provide customer support services on the company platforms. He or she should troubleshoot technical problems and provide solutions to customers. This article provides help desk support interview questions for : IT support, computer support and help desk analyst. The article also provides general questions. There are several jobs that one thinks they will take up when they are children. The job of a flight attendant is just one of them. Some of the known benefits attached to this job are the ability to meet interesting people, see the world in five star accommodations while having a good salary and status. However, though this job has many positive aspects, there are several aspects to it that could make the job stressful. This article provides interview questions for flight attendant, suggests tips for preparation and answers to the questions. This article covers sample of job interview questions for technical desktop support engineers (also called help desk engineers) and provides tips on answering these questions. Being a cabin crew (airline, air hostess) has a host of possibilities and responsibilities. You get to see a world that you might not be able to on your own resources. Because the profession of a cabin crew member is generally thought to be a fun job, there is a misconception that the cabin crew job interview is a simple activity – it is not. This article provides tips, questions and answers for the cabin crew interview. Why Do You Want To Be A Flight Attendant? Why flight attendant? Have you ever faced the question while applying for a job in the aviation industry? I bet you would! You surely have to prepare answering the question about your motivation to become a flight attendant. The interview of a BPO employee and the related questions and answers are quite complicated. The article provides some simple TIPS, questions and their answers. © Copyright 2009 - 2018 All rights reserved.